What do I need besides the XOverWizard II advanced software to make good reliable measurements? 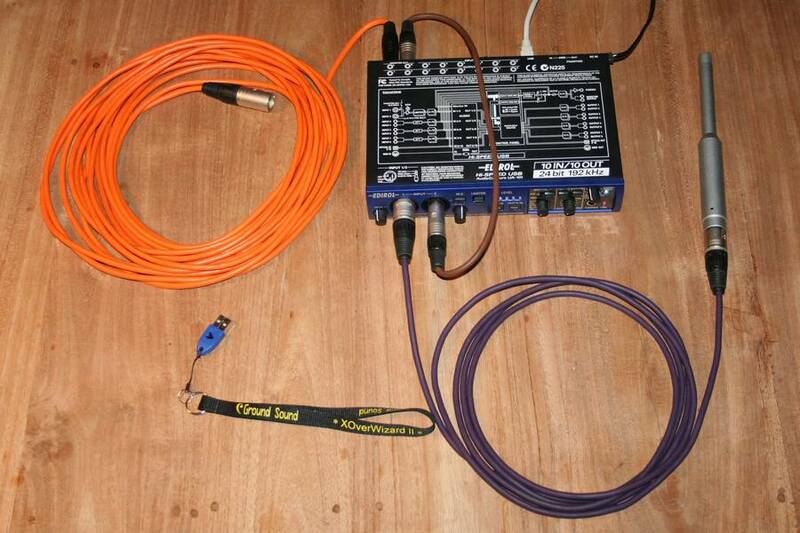 This is the hardware you need for measurement with our software: Condenser microphone, mic preamplifier, soundcard, microphone stand and cables. The soundcard should be external (USB or FireWire) or internal (PCI only stationary PC) with at least 2 inputs and 2 outputs full duplex at least 48kHz, but preferable 96kHz still full duplex (all inputs/outputs running simultaneously at sample rate). You will also need a microphone preamplifier with phantom power (+48V) for the condenser microphone (see list below). Some soundcards include the preamplifier with phantom power and this way you have a simpler solution with much less complications - rather recommendable. Such an external soundcard could be UA-101 Edirol (now obsolete), that has proven its qualities here at Ground Sound = a thumb up. As time goes by there might have come other great USB soundcards that will fulfill requirements for excellent measurements - so scan the web for other possibilities !!! The microphone stand can be a standard one with 3-legs, boom and adjustable height. Required cables depends on hardware, but at least microphone cable, reference loop back cable and cable between soundcard output and amplifier input. Will the XOverWizard software run on Mac? I can say YES (by Bootcamp or virtual machine environment such as Parallels or Fusion, but not natively) although we haven't tested it ourselves, but some of our customers are running the software on their Mac's and others run the software on Linux Operating Systems. How do I know which COM-port number is assigned to the attached digital crossover? If you get an error message you might have chosen a wrong COM Port number. Then you simply press the button Refresh Ports. Now you should be able to see which COM Port number the attached DCN28 has been assigned and be able to program the DCN28 from the XOverWizard II software. In rare occasions your PC / laptop could have had many USB device attached and therefore the Windows OS have assigned many virtual COM ports to different devices - in such rare occasion the number assigned to the current DCN28 might have gone over COM9, which for some reason will not work. In this event you have to reassign a COM port number low than 10 manually. This is done in the device manager described above. How do I import measurements in the standard XOWII version? You can import driver measurements in .txt file format with columns of Freq, dB and Phase. The header should contain Freq dB Phase or similar. See example here: B&W 802D tweeter measurement file. How do I setup the 4 presets in DCN28? DCN28 features the option of having 4 different "Input Processing Block" Presets. These presets are selected via the remote control or via the front panel menu - menu option 3 "Preset". The 4 presets have to be programmed all at once in one setup together with the rest of the setup parameters. The 4 presets "only" operate in the "Input Processing Block" as an overall tonal balance option. A preset has nothing to do with the driver's crossover points and EQ setup (Output Processing Block) and the presets have therefore been chosen to only operate in the "Input Processing Block". How to setup the presets: Have a look at the XOverWizard II tab X-Over. Click the "Edit Filter" button in Input Processing Block A (or B). Now you will see a big empty gray square (if the current preset has NO filter) with a "Back" button in the upper left hand corner and the "square" is labelled "Input Processing Block A" (or B) and the number of used biquads is also indicated (max. 10 biquads). The current preset number is displayed below the gray "square" with the drop down box option of 4 presets. 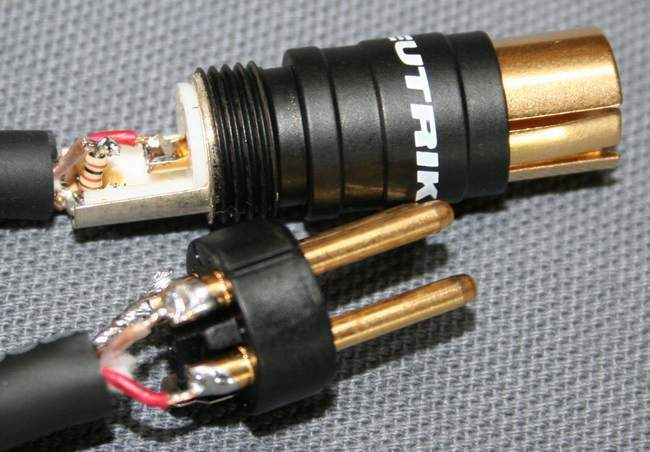 If you got a single-ended RCA / chinch output of your analogue source you to buy an adaptor or buy / make an adaptor cable with RCA connector in one end of a microphone cable (2 conductors + shield) and a XLR connector at the other. 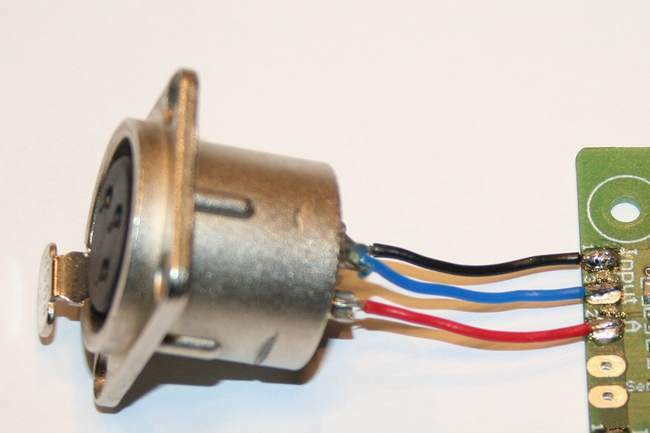 Connect like this: RCA inner connector - conductor (often red) - XLR pin 2 (hot), RCA shield - resistor (100R) or short - conductor (often white) - XLR pin 3 (cold), RCA shield - wire shield - XLR pin 1 (neutral). If a connected power amplifier only has RCA input (singled ended) you will have to use an adapter or better yet an adapter cable. IMPORTANT NOTE: make sure that the inverted output (pin3) is NOT shorted to GND (pin1). You might damage the output buffer in DCN28. 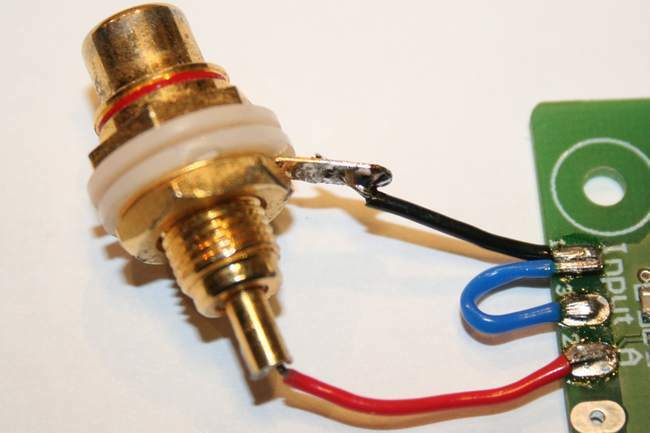 DIY cable connect like this: XLR pin 2 (hot) - conductor (often red) - RCA inner connector, XLR pin 3 (cold) NOT connected, XLR pin 1 (neutral) - wire shield - RCA shield. How do I attenuate the individual output channels of DCN28? There is two ways of attenuating the individual channels in the DCN28 either via the software or via the encoder button on the DCN28 front panel maximum -15dB. If you know there is a big difference between driver sensitivity AND gain of used power amplifier channels it is advisable to attenuate the drivers via the front panel menu, which in turn makes the attenuation in analogue domain. If there isn't much difference between driver sensitivities it's okay to simply do it via the XOverWizard software setup - the attenuation is now done in the digital domain. Theoretically it is better to do the individual channel attenuation in the analogue domain AFTER the DAC, so there is no bit reduction in the digital domain. If the difference is minor the advantage is also minor. How do I set the start volume of DCN28? You can alter the start up volume via the encoder button on the DCN28 front panel. It's done in the last menu option labeled "StartVol"
How do I setup the 2 presets in DCN14, DCN22 or DCN24RPC? DCN14, DCN22 & DCN24RPC features the option of having 2 different "Input Processing Block" Presets. The 2 presets are selected with the push button - preset 1 is selected when the button is "out" and preset 2 when the button is "in". The 2 presets have to be programmed all at once in one setup together with the rest of the setup parameters. The 2 presets "only" operate in the "Input Processing Block" as an overall tonal balance option. A preset has nothing to do with the driver's crossover points and EQ setup (Output Processing Block) and the presets have therefore been chosen to only operate in the "Input Processing Block". How to setup the presets: Have a look at the XOverWizard II tab X-Over. Click the "Edit Filter" button in Input Processing Block A (or B). Now you will see a big empty gray square (if the current preset has NO filter) with a "Back" button in the upper left hand corner and the "square" is labelled "Input Processing Block A" (or B) and the number of used biquads is also indicated (max. 10 biquads). The current preset number is displayed below the gray "square" with the drop down box option of 2 presets. Why can't I programme my new digital crossover? You probably chose the wrong hardware profile in the software - there are two DCN24 profiles: DCN24 (the old version) and the new version (DCN24RPC). You got the new version so you have to choose the DCN24RPC in the pop-up window. The difference between DCN24 and DCN24RPC is the option of making 2 presets in the DCN24RPC version. Why can't I communicate with the digital crossover? First of all you have to check if the wires to the USB pads are correctly connected. Often D+ and D- have to be changed because they are switched in a connector like the Neutrik NAUSB chassis adaptor. In this case you'll get a pop-up window like this USB Device Not Recognized. Remember to disconnect the cable to the PC before switching the white and green wire. NOTE: We recommend to use USB-cable of maximum 5m otherwise you might get communication problems and the pop-up window might also pop-up. How do I install the driver for the USB-interface? The USB-interface is actually an onboard USB to COM Port (RS-232) adaptor and the circuit is made by FTDIchip.com. The driver for this device can be downloaded here FTDI driver (Windows OS) or at the manufactures web page - also drivers for Mac. If you place the driver file on the desktop, it's easy to find and to point out to the installation wizard. Is it possible to change the assigned COM-port number? Yes - you go to the Device Manager (see how above) and open the properties by right click Properties or double clicking the device. Choose the Port settings tab - open the Advanced... - change the COM Port Number to the desired number - look out for conflict, if another device has been assigned the same COM Port number. The processing power of your filter is given in number of biquads. What can a biquad do? One biquad can do either a PEQ, Notch Filter, 1.order High-Pass Shelving Filter, 1.order Low-Pass Shelving Filter, 2.order High-Pass Filter, 2.order Low-Pass Filter or one All-Pass. E.g. DCN23 could do 4.order High-Pass filter + 4.order Low-Pass filter + one Notch filter + 11 x PEQ in one channel equal 16 biquads. Try it out for your self: XOW.zip. You can see how many free biquads is left for extra processing in each channel just above the Driver Box. Is it possible to supply 2 x DCN23 digital crossovers from one PSU DCN II? NO - The PSU DCN II has more that enough power for one DCN23 and the onboard control circuitry is also adequate for one relay board, but will be overloaded if 2 x DCN23 or 2 x relay boards are attached. PSU DCN II is simply designed to power "only" one DCN23. How do I connect a RCA / phone plug to the balanced input of the digital crossover? How is the balanced input connected to the XLR connector? How do I make a RCA / chinch to XLR cable? Can I use my "old" +/-15V power supply from my current analogue active crossover? Yes - maybe - no - depends highly on the "old" power supply. It has to be able to provide the total current of Vdd, Vcc and +Vs at least 300mA from the positive rail and 80mA from the negative rail. It shall be able to cope with uneven loads or you have to make circuitry that loads the negative rail the same as the positive rail - balanced load supply. You'll have to ad regulation for the Vdd (3,3V) and Vcc (5,0V). You need some kind of muting to protect the amplifier from DC bumps at power on and off. Can I use the digital crossover with switching amplifiers - Class D? Will a SMPS power supply for amplifiers affect the performance of the digital crossover? Can I build a stereo satellite loudspeaker system with mono sub with a single DCN23 digital crossover? Yes - you can build a 2.1 system, because DCN23 has two independent input channels A and B. These two channels can be processed by the 3 DSP channels and outputted through two dual channel Digital Analogue Converters. One DAC converts the first two DSP channels and the second converts the third DSP channel. The third DSP channel is outputted as non inverting and inverting from this second DAC - this way you can easily bridge two amplifier modules for higher bass power capability. The signal for this third DSP channel is a mix of the two input channels (A+B/2). It's presumed that the satellite speakers have full-range drivers or have passive crossovers for drivers. Does DCN23 have a DC-blocking capacitor at the output? No - DCN23 do not have any DC blocking capacitors as our amplifier modules have it at their input. It is highly recommended to have a DC-blocking at the input of the attached power amplifier to prevent the amplifier from either putting out DC or going into protection mode. If capacitors were placed both at DCN23 output and at the input of the amplifier you would get more group delay and a higher High-Pass frequency. How do I optimize for best performance in the DA converter? How do I optimize for best performance in the AD converter? To obtain the best resolution in the AD conversion you might think that it "only" to ensure that you get as close as possible to the maximum input - e.g. 4Vpp for DCN23. But no - you have to make sure that when the DA converter reaches it maximum voltage swing = maximum binary value (0dB) in the digital domain the AD converter should also reach is maximum binary value. Now you see that it has nothing to do with 4Vpp and then again it has. When you input a signal of 4Vpp you will have 0dB at the AD converter in the digital domain - so you have to make sure that 0dB in is 0dB out in the digital domain. Where do you do that? In the software - you will have to make the setup so that its overall gain is 0dB for the channel that has to have the highest gain and the others -xdB. Download an Example for the XOverWizard and see how. Why do I get distorted sound using your digital filters? In general you don't get distorted sound only occasional at higher volume. Then you're simply over the top - which means that you input stronger signals that 4Vpp at the input of the filter. Options to solve the problem - don't play this loud or optimizing the filter setup can give a bit more head room or get some drivers with higher sensitivity or don't try to make the drivers do something that they are not capable of or get higher powered amplifier or live with the fact that you don't have a PA system. Explanation to the optimization of filter option: This could be that you try to extend the bas response of a small mid-bass woofer to a point where you gain the low part of the response with a low shelving filter or PEQ of +10dB and by doing this you simply loose the gain in head room limited in X max or in the power capability of the amplifier. Sometime you can get away with this little trick by adding a steep high-pass filter type Butterworth 48dB/oct. or 96dB/oct. at an appropriate frequency to save the woofer for break down etc. I repeat - Why do I get heavily distorted sound using your digital filters? You are using the filter direct coupled to a source and you regulate the volume after the filter - by doing so you consequently get a distorted sound because you overload the DA converters in the digital domain, which means that you try to output signal levels with higher values than 24 bits. Or you are consequently are overloading the AD converter with input signals higher than the 4Vpp maximum. If you overload the AD converter you simply turn down the output signal or insert an attenuation made of two resistors. In the first case of DA converter overload you are not obeying rule of 0dB gain or less in the digital domain. In the software - you will have to make the setup so that its overall gain is 0dB for the channel that has to have the highest gain and the others -xdB. Download an Example for the XOverWizard and see how. Can I implement a Linkwitz transform in your digital crossover? Yes - Linkwitz transform is simply two PEQ placed in a manor so that you get extended flatter bass response in a closed box to a lower frequency. The first PEQ boost the bass 12-15 dB at a very low frequency and the second PEQ levels out the peak that comes from the first PEQ to flatten the response. BUT instead I do recommend measuring the system to see what is really needed for a much more accurate flat extended bass response. Is it possible to use the same power supply for PA1CC and PA3CC amplifier modules? Yes - You can supply PA1CC +/-25-65V (recommended +/-50V) and PA3CC +/-30-90V (recommended +/-65V) - so yes they can be supplied from the same PSU. We do the same on Coolback II 600 at +/-63V rails - PA1CC takes care of the tweeter and therefore has a lighter load (assuming normal dome tweeter and minimum recommended load 4Ω). Theoretically PA1CC and PA3CC will give the same power at the same voltage, but due to thermal and current limitations this doesn't apply. I want to make an active 3-way system and I need 100W/150W/400W - what can I do? You could make separate power amplifiers, each with its own power supply. - But it will be very costly whereas an integrated solution based on PSU12SA and one power transformer for the amplifier rails will be all-in-one - including Soft Start and Auto On/Off. But YOU know that the same rail voltage (e.g. +/-63V) for the amplifier will give you the same power capability for all three amplifiers (~200W at 8Ω) - into the same load. If you have the possibility you should order the woofer as 4Ω and the tweeter and mid as 8Ω this way you get 400W for the bass, 200W for the mid and 200W for the tweeter - a little bit too much for the tweeter, but all-in-all a very healthy system. Is it possible to bridge two PA3CC? Why don't you use PCB connector and FastOn for faster assembly? Although PCB connectors and FastOn makes the assembly somewhat easier and faster - our experience tells us that this often courses a lot of early service while a good soldering will last as long as the electronics. Why go to compromise when you can avoid it and we find it very annoying to have to open a box again just to cure a bad connection in a "fast and easy" assembled system while the electronics is still performing.